With the renewal of Baptismal vows as the goal of Lent and the goal of Marian Consecration, one can rest assured that taking on the 33 days of preparation for Marian Consecration will be a fitting way to enter into the remaining weeks of Lent. The Office for Youth Evangelization and Discipleship would like to invite everyone to join with them in making the preparation for, and consecration/renewal of consecration to Jesus through Mary on the celebration of the Annunciation this year. For more details, check out our webpage. Superstition motivated my first Marian consecration. It all happened during my senior year of high school - a preparation process that led me to my friend's house each night as we marathoned our way through St. Louis de Montfort's prayers from late November to January 1st. The logic behind my motivation was fairly sound: how could I not get into Our Lady's university if I consecrated myself to her? Gaining admission to the University of Notre Dame was, at that time, the driving force of my life. It was virtually all I thought about and it stood behind every decision I made. Naturally, I took up the invitation for consecration with almost entirely self-centered motives. It was about me getting, not me giving. For a little over a month I faithfully muttered my way through the litanies, and prayers, and rosaries, until our consecration day rolled around - the Solemnity of Mary, the Mother of God. It was Jan. 1, 2004. I wrote the entire act of consecration out by hand and dutifully recited it following Mass at St. Mary Catholic Church in my hometown. Unfortunately, or fortunately, depending on the way you look at it, I was mistakenly standing before a statue of St. Thérèse of Lisieux as I made the act. I even left my signed consecration prayer at Thérèse's feet. My Catholic IQ at the time was rather low. In the end, my superstitious and Herculean attempts at gaining entry to Notre Dame failed. I was crushed, but my pride recoiled. I decided I would attend the next most prestigious school to which I had been accepted, and I would pursue journalism because I wanted to write the articles that would be on the front page of all the big newspapers. I didn't care so much about the news -- only about salvaging my name. My pride had reached its heights. By early October of 2004, my life had reached a crux point. The sinful life I had been leading, one that ultimately led to isolation, was being confronted by the Gospel incarnate in the Eucharist. That month, I gave in to the Lord and entered into the lifelong process of learning how to trust Him with everything. Many years later, when invited to participate in Marian consecration again, I remembered that first, 'superstitious' consecration that took place as we celebrated Mary's motherhood. Not surprisingly, my conversion happened full-term - about 9 months later - and around St. Thérèse's feast day. I believe they both took my poorly motivated and sloppy attempt at a consecration and made something beautiful out of it. In fact, this has taught me that Mary always takes what I have to offer, however small or whatever the motivation, and she makes it into something beautiful for her Son. It also taught me that Marian consecration is, in fact, more about God's initiative in giving me a Mother who can foresee what I really need (cf. Jn. 19: 26-27), rather than my own feeble attempts to, on my own, make my life a fitting offering for the Lord. I’ve always been captivated by the story of the Magi. I think it is because they are such mysterious figures who set out on a path of longing - they have a desire for the infinite and the courage to follow it. Needless to say, I spend a fair amount of time each year meditating on this story. Regardless of Jesus’ exact age at the time of the Magi’s arrival, he was likely still quite young. Traditionally and in iconography, we imagine that Joseph is on the scene, or at least nearby. What we know from Matthew’s account is that Mary was definitely there with her baby. Suddenly, mysterious men from the East arrive, speaking in a different tongue, prostrating themselves, and offering gifts. What would most any mother do in a situation like this? What would most babies do who have enough awareness around strangers? Well, seeking security, the baby/child/toddler searches out and clings to the source of security: mom. And mom, happy to receive the strangers and the gifts, holds them and allows the baby to open it, or at least to behold it. If these normal dynamics hold true in Jesus’ infancy, then it seems quite possible to believe that the Magi offered their gifts to Our Lord through Mary, His mother. The Magi travel all this way to adore Jesus as He is presented to them by Mary, and to offer Him gifts through Mary. This account hints at what Marian Consecration is all about - offering the gift of our very selves to Jesus through Mary. 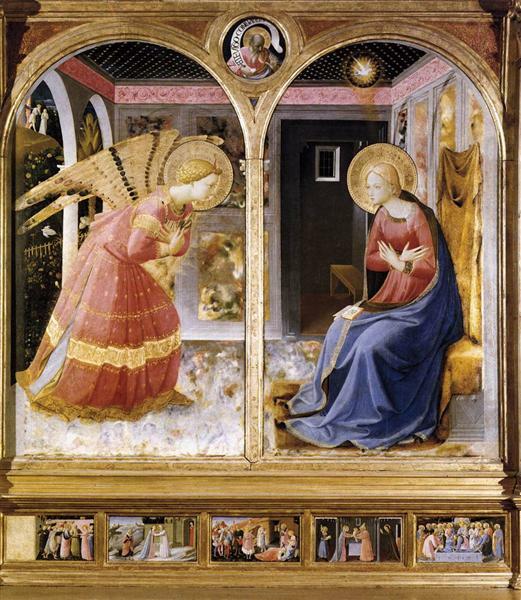 Each year, the Office for Youth Evangelization and Discipleship embarks on a 33-day preparation process according to the method of St. Louis de Montfort, and each member consecrates him/herself (or renews his/her consecration) to Jesus through Mary on the Solemnity of the Annunciation. This year, due to the Annunciation falling on Palm Sunday, that solemnity has been moved to April 9 - meaning preparation for the consecration begins on Mar. 7, 2018. We would like to invite anyone and everyone, especially youth/campus ministers, spiritual liaisons, and coaches, to join us in the preparation and consecration this year. So, mark your calendars for Mar. 7 and stay tuned for more details about this powerful devotion.